The bilayer structure of liposomes is nearly identical to the bilayer construction of the cell membranes that surround each of the cells in the human body. This occurs because of the unique composition of phospholipids. 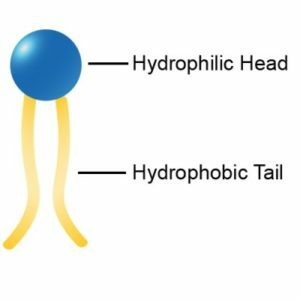 The phosphate (source of “phospho” in phospholipid) head of phospholipids is hydrophilic — it loves water — whereas the fatty-acid tails (lipids) are hydrophobic — they hate water. 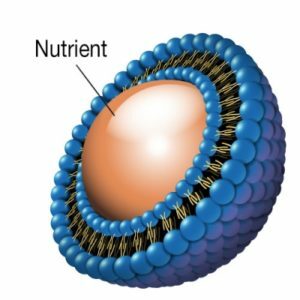 Although research has not clearly shown how the nutrients in a liposome are actually released, there are a couple of theories. One theory suggests that the phospholipids are processed in the liver as fats and that this process releases the nutrient. Another theory proposes that cells all over the body, hungry for phospholipid materials to repair cell membranes and other cellular structures, “steal” these materials from the liposome allowing their contents to leak out. Quite possibly both processes occur. In any case, the therapeutic value and greatly increased delivery of liposome-encapsulated drugs and nutrients has been scientifically confirmed countless times. At present, liposomes are the most bioavailable oral way to deliver nutrients.